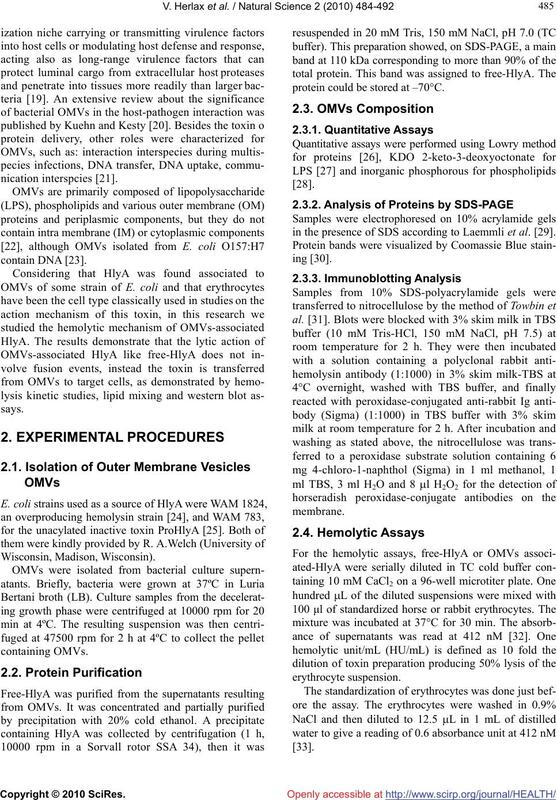 Received 2 January 2010; revised 1 February 2010; accepted 2 February 2010.
tion mechanism of HlyA near the target cells. protein could be stored at –70°C. in the presence of SDS according to Laemmli et al. .
containing 10 mM CaCl2 were placed into a cuvette. cuvette, and the absorbance at 650 nM was measured. μM pore size membranes as described by Mayer et al. transfer between NBD as donor and Rh as acceptor. pectively. Slits for excitation and emission were 4 nM. of Triton × 100 to disperse maximally the probes. laboratory strains and also from natural and clinical E.
the bacterial outer membrane (data not shown). proteins also present in OMVs. suspension used in hemolytic experiments. increasing the distance between donor and acceptor . FRET decrease (data not shown). arrows correspond to the addition of OMVs or free-HlyA. 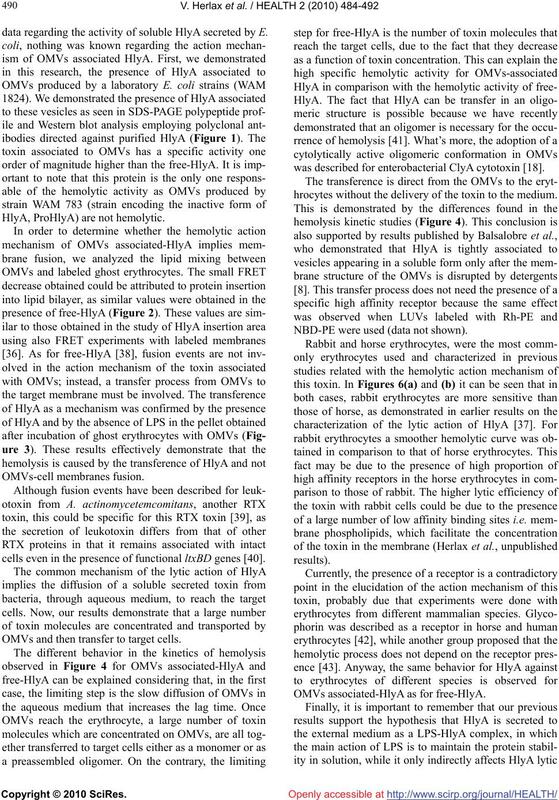 free-HlyA and OMVs associated-HlyA were used. 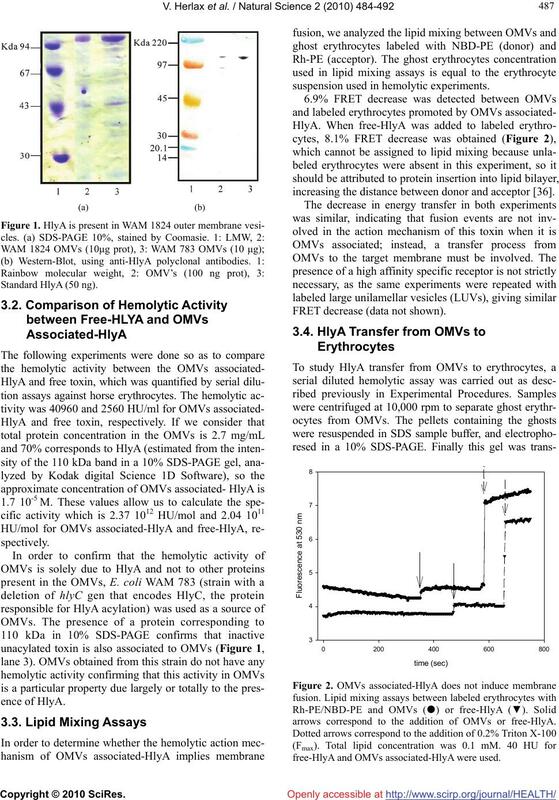 hemolytic activity observed (data not shown). 4: Standard LPS from E. coli 011:B4. Typical hemolysis time courses are shown in Figure 4.
molecular weight and volume compared to free-HlyA. from Figure 5 at different toxin concentrations. rabbit and horse erythrocytes respectively. horse erythrocytes of 2.81 and 22.5 nM, respectively. San Rafael, CA) fitted a sigmoidal curve in both cases. OMVs associated-HlyA as for free-HlyA. with rabbit erythrocytes (●) and horse erythrocytes (○). 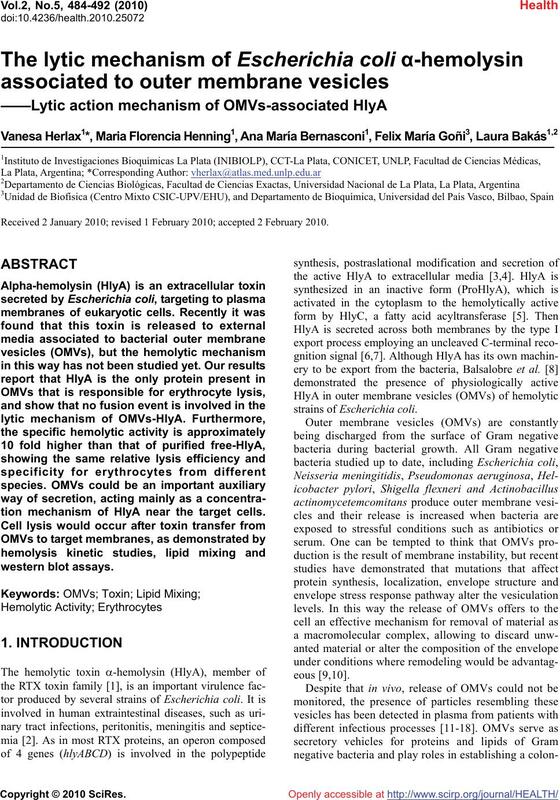 data regarding the activity of soluble HlyA secreted by E.
HlyA, ProHlyA) are not hemolytic. cells even in the presence of functional ltxBD genes . OMVs and then transfer to target cells. was described for enterobacterial ClyA cytotoxin . hrocytes without the delivery of the toxin to the medium. NBD-PE were used (data not shown). release of inflammatory mediators . without altering its lytic action mechanism. (CONICET), Argentina and MFH is a Fellow from CONICET, Argentina. ria. FEMS Microbiology Reviews, 88, 137-162.
genicity. Microbiology Reviews, 48, 326-343.
tive bacteria. Molecular Microbiology, 5(3), 521-528. 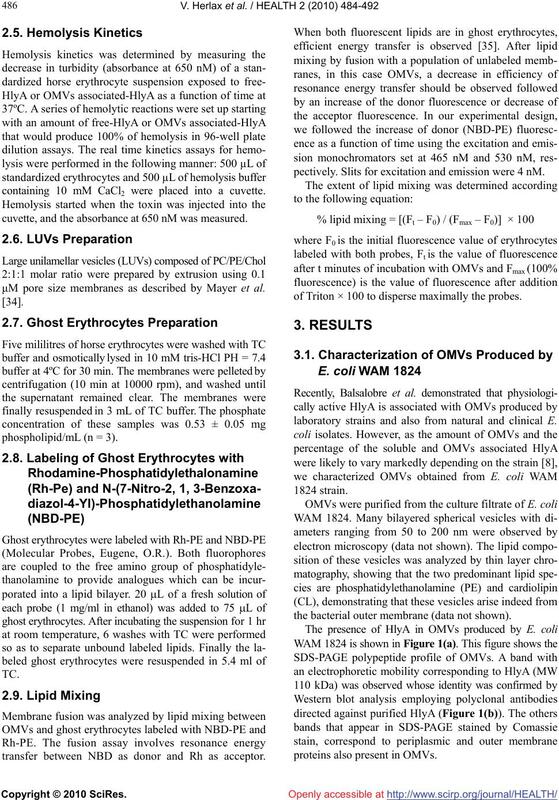 Molecular Biology Reviews, 62(2), 309-333. Jarchau, T., Chakraborty, T., Garcia, F. and Goebel, W.
ids of HlyA. Molecular and General Genetics, 245, 53-60. Escherichia coli. Molecular Microbiology, 59(1), 99-112. 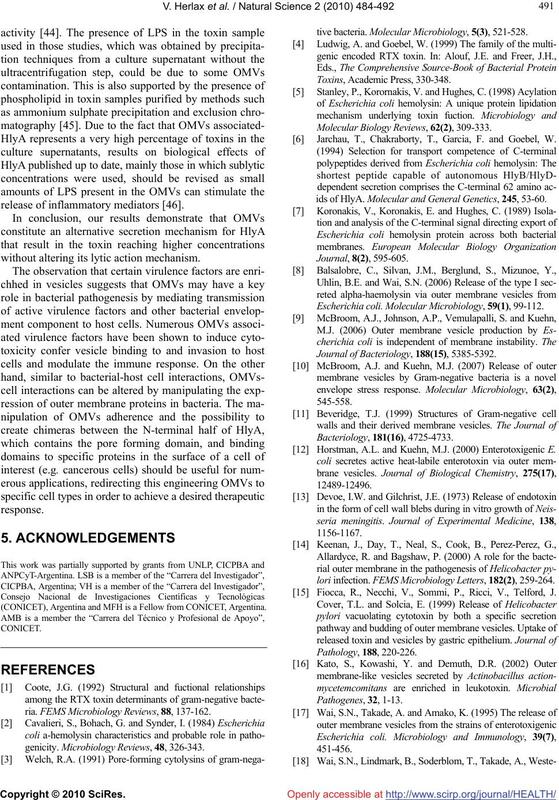 Journal of Bacteriology, 188(15), 5385-5392. Horstman, A.L. and Kuehn, M.J. (2000) Enterotoxigenic E.
lori infection. 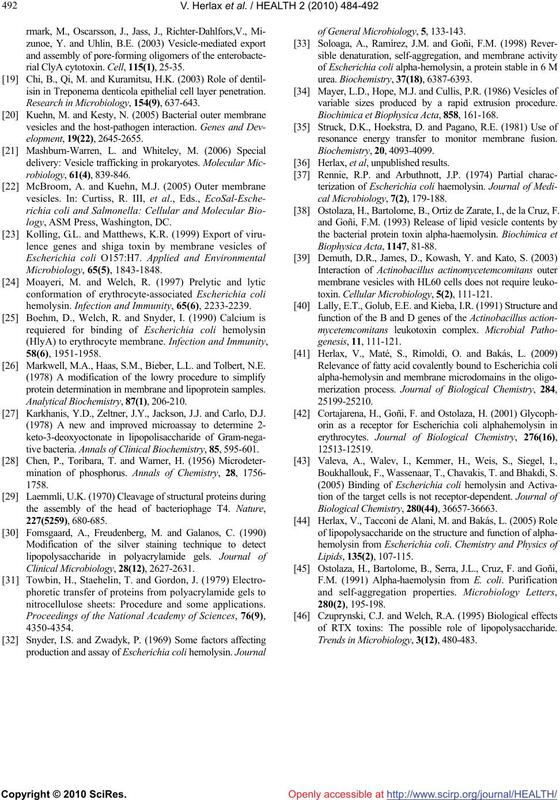 FEMS Microbiology Letters, 182(2), 259-264. Fiocca, R., Necchi, V., Sommi, P., Ricci, V., Telford, J.
rial ClyA cytotoxin. Ce ll, 115(1), 25-35.
isin in Treponema denticola epithelial cell layer penetration. Research in Microbiology, 154(9), 637-643.
logy, ASM Press, Washington, DC. hemolysin. Infection and Immunity, 65(6), 2233-2239. Markwell, M.A., Haas, S.M., Bieber, L.L. and Tolbert, N.E. protein determination in membrane and lipoprotein samples. Karkhanis, Y.D., Zeltner, J.Y., Jackson, J.J. and Carlo, D.J. tive bacteria. Annals of Clinical Biochemistry, 85, 595-601.
nitrocellulose sheets: Procedure and some applications. of General Microbiology, 5, 133-143.
variable sizes produced by a rapid extrusion procedure. Biochimica et Biophysica Acta, 858, 161-168.
resonance energy transfer to monitor membrane fusion. 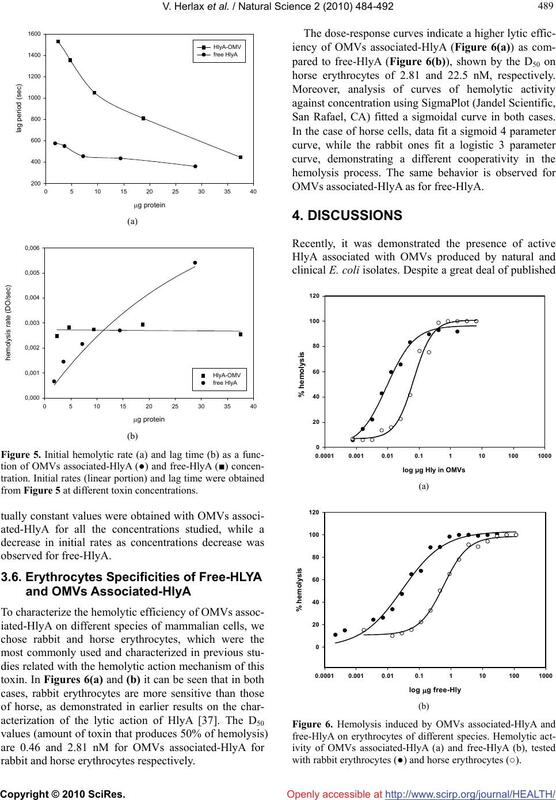 Herlax, et al, unpublished results. Ostolaza, H., Bartolome, B., Ortiz de Zarate, I., de la Cruz, F.
toxin. Cellular Microbiology, 5(2), 111-121. 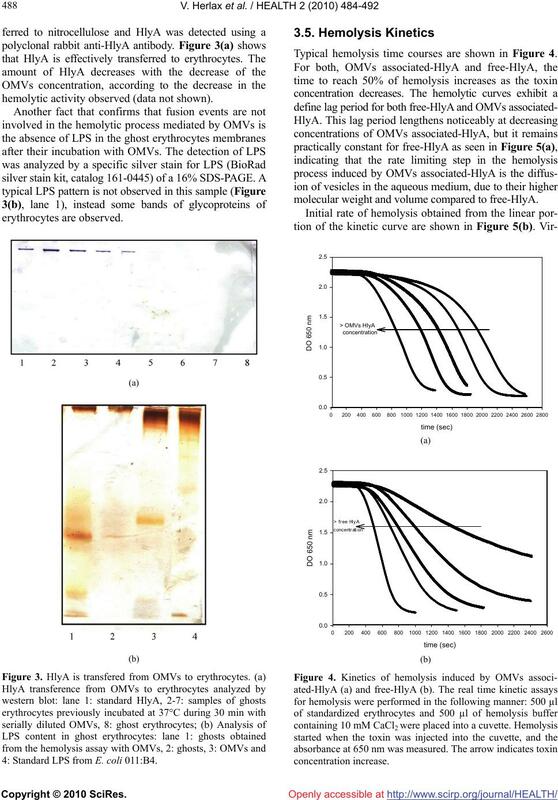 Boukhallouk, F., Wassenaar, T., Chavakis, T. and Bhakdi, S.
of RTX toxins: The possible role of lipopolysaccharide. Trends in Microbiology, 3(12), 480-483.